 MSRP $19,612. This close-ended lease for a 2019 Subaru Impreza 2.0i AWD, JUO available to well-qualified lessees. First month’s payment of $198 plus TT&L due at signing. $0 security deposit. Total monthly payments = $7,722. 12k miles per year, additional overage fee of 15¢/mile may apply. Lessee is responsible for all maintenance unless otherwise specified. Additional fees for early termination, payment delinquency, and/or excessive wear and tear may apply. Lessee must provide appropriate auto insurance throughout lease term of 39 months. Must take delivery from dealer by 12/31/2018. See Austin Subaru for details. 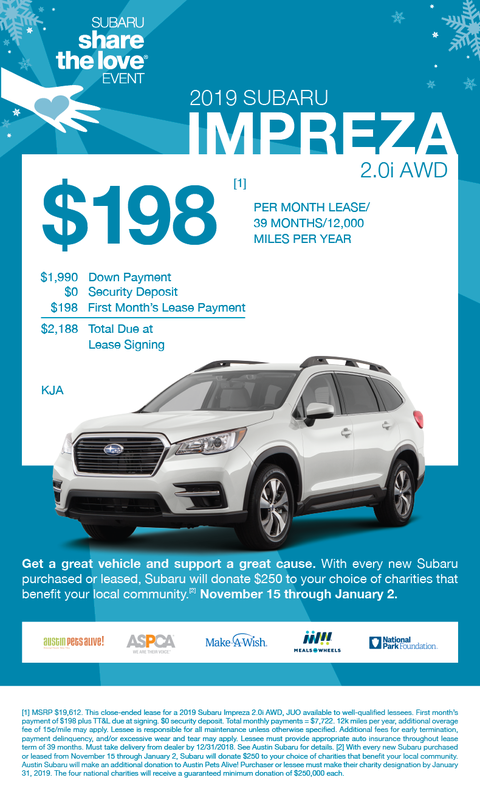 With every new Subaru purchased or leased from November 15 through January 2, Subaru will donate $250 to your choice of charities that benefit your local community. 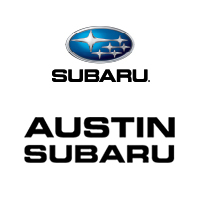 Austin Subaru will make an additional donation to Austin Pets Alive! Purchaser or lessee must make their charity designation by January 31, 2019. The four national charities will receive a guaranteed minimum donation of $250,000 each.